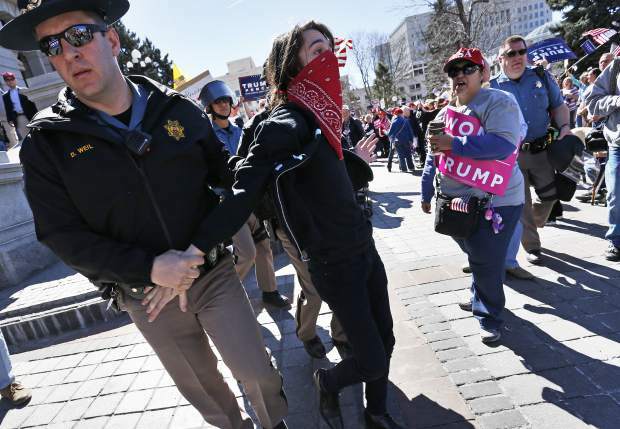 DENVER — Several hundred people rallied in support of President Donald Trump outside the state Capitol in Denver on Saturday, listening to speakers including former U.S. Rep. Tom Tancredo and sometimes facing off with a much smaller group of anti-Trump demonstrators. Chelsea Thomas, an accountant from the suburb of Thornton, came with her husband and two children along with other members of her extended family and a life-size cardboard cutout of Trump. She stood next to the cutout, which Thomas said the family has taken with them on camping trips, boat rides and a country music festival, while holding a Trump banner on the hill at the bottom of the steps facing out toward busy Lincoln Street and a group of anti-Trump demonstrators corralled on the sidewalk by police. Thomas and her family campaigned for Trump, but she wasn’t able to attend one of his campaign rallies. She works at a school among teachers who mostly oppose Trump, so she feels she can’t express her support for him there. “It’s nice to be surrounded by people who share your morals and opinions,” said Thomas, as her son walked back and forth across the grass with a large Trump flag. Rather than listening to the speakers on the steps, a large clump of the Trump supporters turned for a time to face and sometimes taunt the anti-Trump protesters, many of them wearing all black and their faces mostly covered with scarves. Two lines of officers and an expanse of grass separated the two sides. At one point, the rally speaker asked demonstrators to turn away from the counter-demonstrators and not to taunt them, saying that would make things easier for police. Many did. but a recording of a Trump speech continued to play through the megaphone pointed at the rally protesters. Later some of the anti-Trump demonstrators briefly set a large American flag on fire. Some of the protesters who were dressed in regular clothes objected and an argument broke out. “I love my country. That’s why I’m here,” attendee Hannah Harris told them. Some told her she should ask Native Americans and people in Puerto Rico what they thought the flag stood for. After Rachel Wood, a black-clad protester, stepped in to try and bring both sides together, some objected when Wood asked them to educate Harris, who is white, about what they meant. Later, Wood explained that she wanted the protesters to see that Harris stood with them, even if they disagreed on tactics. “When we’re all together we need to stand together,” she said.